Gordon Brown is back. Again. Earlier this week, to mark the tenth anniversary of the financial crisis, the former prime minister treated us all to another nakedly self-serving political intervention. There’s nothing particularly controversial about Brown’s main point – he is right to flag-up the risk of another crisis, although he’s hardly the first person to do so. It’s everything else he says that I find problematic. 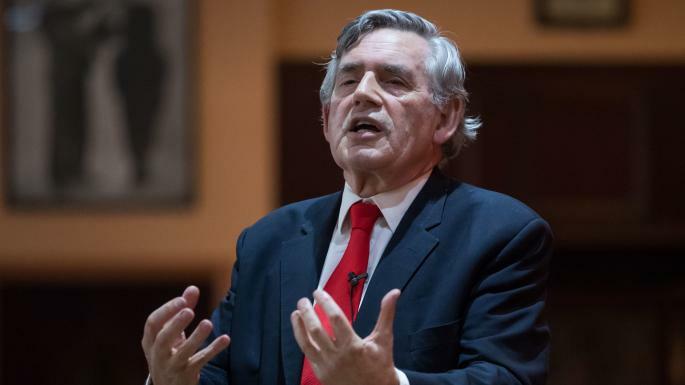 Let’s be clear: Gordon Brown bears a sizeable share of responsibility not just for the 2008 crisis itself, but for the catastrophic mishandling of its aftermath and for the current atmosphere of nativist toxicity in British politics. Let’s start with New Labour’s relationship to the UK banking industry. In 2001, the Blair-Brown government established a new Financial Services Authority (FSA) designed to streamline regulatory constraints on the City of London and consolidate the UK’s global “competitive advantage.” The FSA swallowed up nine separate bodies into a single agency in order to provide – as Brown boasted at the time – “not only light but limited regulation” of British banks. The result was a spectacular failure of oversight. Britain’s regulatory watchdog wasn’t properly equipped to discipline the banks if it suspected they were doing something wrong. In fact – perversely – its chief function seemed to be to make life easier for them. What’s more, in 2009, FSA head Adair Turner told a parliamentary committee that the agency had come under political pressure to further loosen restrictions on financial institutions. “There was a philosophy rooted in political assumptions which suggested the key priority was to keep it light rather than to ask more questions,” he said (‘Gordon Brown helped fuel banking crisis – FSA head’). So the suggestion that New Labour was blindsided by City malfeasance doesn’t stack up. On Brown’s watch, the government did everything it could to encourage risk-taking behaviour within Britain’s dangerously over-sized and unruly financial sector. Brown is equally culpable for the austerity regime that came into force in 2010. Granted, he was one of the leading global advocates – alongside Barack Obama and the US Federal Reserve – for stimulus spending as an immediate response to the crash. And, had he won the 2010 general election, he wouldn’t have cut expenditure as recklessly as David Cameron and George Osborne did. Nonetheless, Labour’s 2010 manifesto was crystal clear: from 2011 onwards, deficit reduction would be the government’s overriding priority. Indeed, Brown went into the election pledging a series of “tough choices” on Britain’s national finances. These included £15bn worth of “efficiency savings”, £11bn worth of “operational efficiencies”, a public sector pay cap, welfare reform, an increase in National Insurance contributions, and £20bn worth of “asset sales” – or privatisations – by 2020. Moreover, Brown’s tenure as chancellor was characterised by an overwhelming PR obsession with ‘fiscal prudence’ and ‘budgetary discipline.’ He may have significantly increased key aspects of social spending, but he did so by balancing the increases out with tax hikes in order to keep public debt low, run annual surpluses, and manage inflation. Ultimately, Brown’s sensitivity to the charge that he was financially irresponsible lent credibility to Osborne’s later (manifestly false) claim that Britain had to eliminate its deficit before it could return to economic health. In other words, many of the major decisions Brown made at the Treasury framed and reinforced the political rationale that Cameron and Osborne used to justify austerity. Which brings me to my final point. Brown did a lot of ideological grunt work for the right in terms of the economy and spending cuts. But he shamelessly bolstered its social and cultural narrative, too. In and out of power, Brown has repeatedly appealed to the worst atavistic tendencies of the UK electorate. On a trip to Tanzania in 2005, he told reporters that the UK should “celebrate” its colonial past. In 2009, he argued that “British jobs” should be reserved for “British workers.” And as recently as June of this year, he was calling for a crackdown on immigration as part of a broader package of policies to help “address people’s anxieties” over Brexit. All of this highlights the emptiness and cynicism with which the ex-chancellor is currently trying to salvage his political legacy. He wasn’t duped, as he now claims, by the criminality of the UK banking sector – he enabled it. He wasn’t opposed to austerity – he championed it. And he doesn’t find populist language unsettling – he uses it himself when it suits him. Brown might be right about the inevitability of another economic crash. But if we want to handle the fallout from the next crisis more effectively than we did the last one, he is the last person we should be listening to. The irony about brown is that he was and is nothing without blair, what’s worse for brown, he knows this! He owes his place in history to a man he detests, not on policy, but personal grudge. brown has been been in denial during and since labour came to power in 1997. brown has been wrong on most things and is both a bully and a coward. – no appology for PFI and its continuing drain on government coffers that contribute to austerity. – no appology for letting the tories rukle from 2010 onwards when anti coalition could have been formed. – no appology for austerity. To put it very simply, his moral compass was uterlly shagged. New Labour, Old Tories, exactly the same and for a time, a long time, we in Scotland bought the Labour pile of shite. What I can’t understand about Brown is that he surely can see that Westminster has used and abused Scotland for many decades. As a so-called historian, he would surely know that the origins of the Labour party in Scotland had their roots in home rule, even as far as dominion status. Why did he dismiss all this to opt for his North British status? A bigger charlatan it would be harder to find. Brown’s guard dog, Damien McBride, INVENTED ‘Project Fear’ as a tool for devolution_1 … and you can’t keep a good idea hidden. The Blair/Brown regulatory auto-d’-fe was a well-trod, entirely predictable morality tale. Drag your chair closer and hear. Worldwide, generally speaking – and NOT without reason, history & evidence – bankers & the political left do not trust each other. The absolute BEST a Labour/Democrat/Social Democrat party/administration can hope for is that ‘banking’ will stay neutral, which was Alastair Campbell’s masterwork when he invented the Prawn Cocktail Offensive. The City stayed out of 1997. Bankers WIII get ‘softly, softly’ and favourable tax treatment. 100% of the time. Both sides know the Faustian Bargin of Æsop’s ~The Toad and the Scorpion~ only ends one way. ‘Political Power’ is sooooo addictive and while the music plays, you dance! Jamie, have you an idea who is managing his renewal? Jamie Maxwell’s core argument, that Gordon Brown lacks credibility is accurate. However, not all his article stands up to scrutiny. The reference to running annual surpluses includes a link to a 2001 article. It was after this, between 2002 and 2008, that deficits – averaging 2.5% each year – that were run up. The problem was that he had come to believe his own propaganda; a delusion captured in the ‘no more boom and bust’ mantra. A Keynsian would have used these years to harvest a surplus for lean times ahead but, for Gordon and his mentor Alan Greenspan, lean times had been banished. The economic collapse in 2008 destroyed his credibility even if it happened in slow motion. He is in the news because there is not enough else to fill up the airwaves. Not for the first time, Jamie Maxwell denounces austerity. When there is a huge fall in GDP, there are huge extra liabilities taken on board and you start from a point of running deficits year on year, austerity is unavoidable. The real problem facing the UK (and Scotland whether as part of it or independent) is that nobody has come up with a credible economic model to replace the one discredited in 2008. By credible, I mean one that voters will elect a government to introduce. But is Britain living high as it did during the exploitations of its official imperial period only now on the backs of neo-colonialism, security council diplomacy and modern slavery? What exactly does Gordon Brown think we can afford? The financial sector skims and not creates wealth. Do his statements add up to a coherent political philosophy? Many children still suffer in poverty, many ex-colonies are burdened by unjust debt. So very true. Debt Peonage is the ultimate form of imperialism. As the countries involved with China in the Belt & Road Initiative are discovering. How do you know it was oversight? What makes you think this wasn’t and isn’t the global banking plan all along? Did the system break down where all debt and wealth were levelled? Did London Banksters not cheer when RBS fell? From a Scottish tinfoil hat independence supporters perspective I could say that all things currently fowl in Scotland’s back yard are down to manoeuvres from London. Not just the obvious MSM scattergun approach but precise plays made to monopolise the system which in turn (of the wheel) produces fascist states, and with the right prod, rudderless people into fascist individual mobs. Erm. ” currently foul”. This isn’t Christmas we’re voting for and we ain’t turkeys.